This room suffered from a water loss. 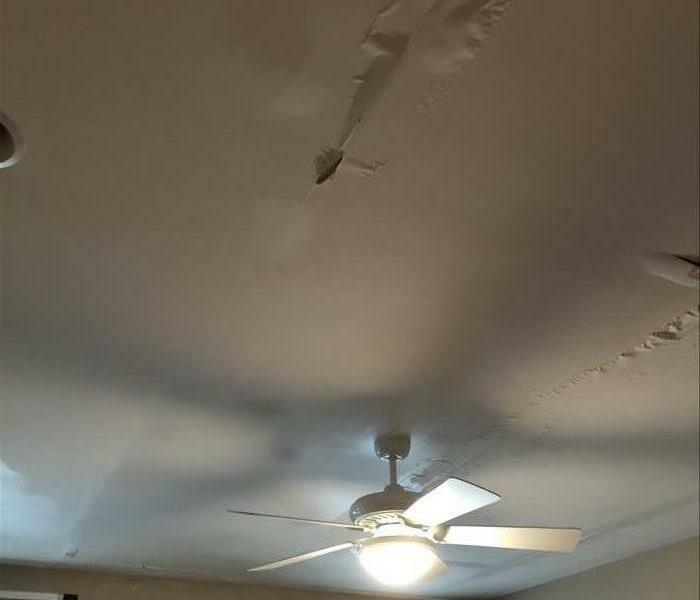 There was significant water damage throughout the property. 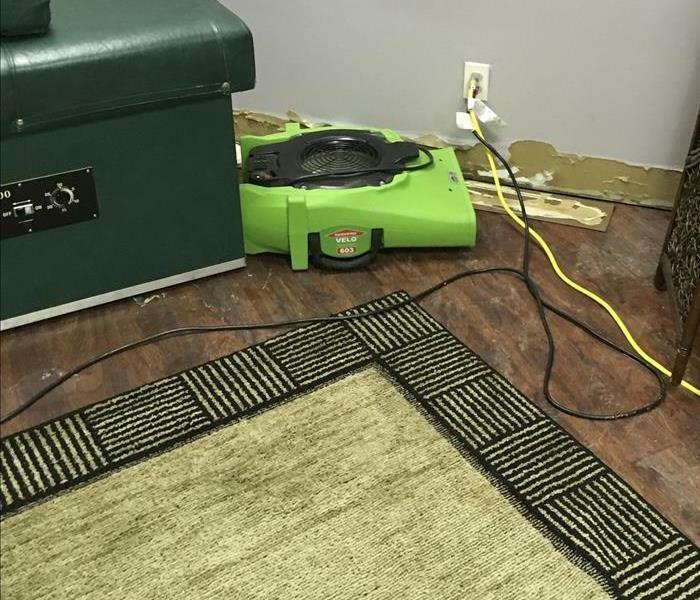 The baseboards were removed and air movers put in place for quick and efficient drying. 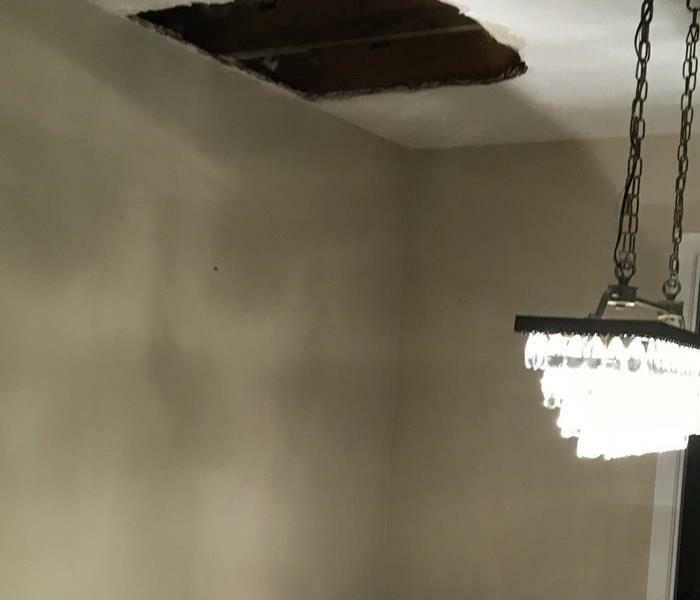 This ceiling suffered from water damage after a pipe break on the second floor. The water flooded the second floor and damaged the ceiling and down into the basement. The walls and ceilings had to be removed, dried and replaced. 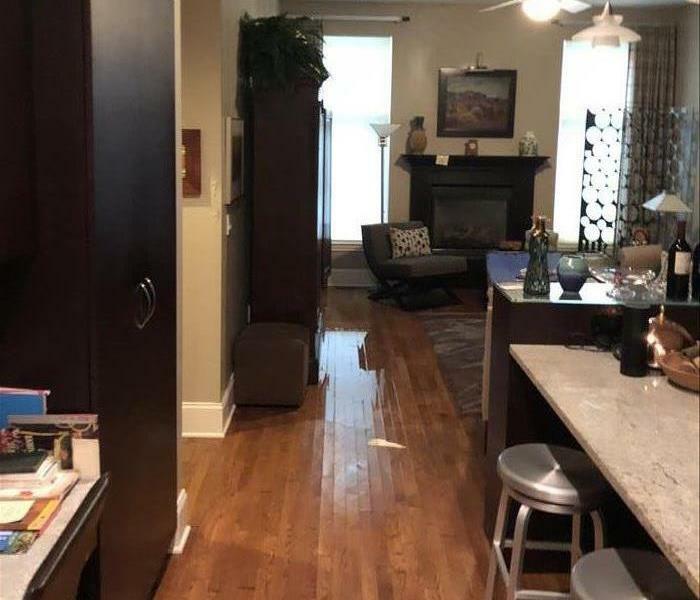 This kitchen and living room suffered from a water loss. The water had spread throughout the floors. 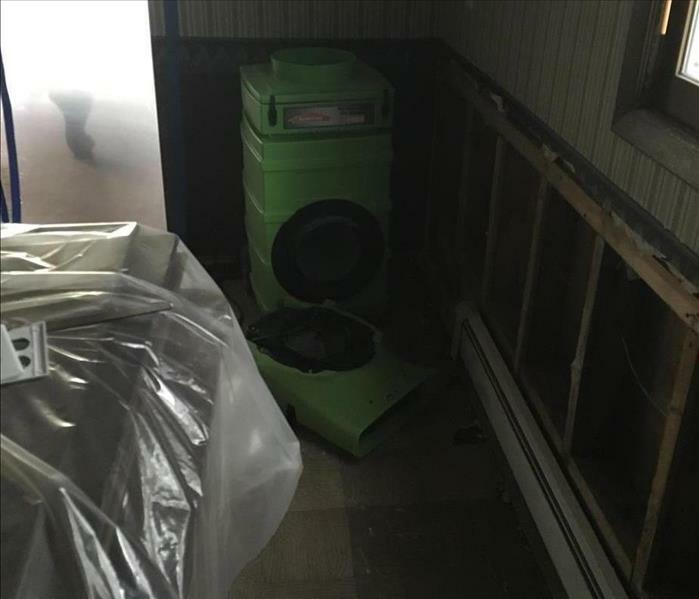 SERVPRO responded and quickly begin clean up procedures to prevent further damages to hardwoods and belongings. 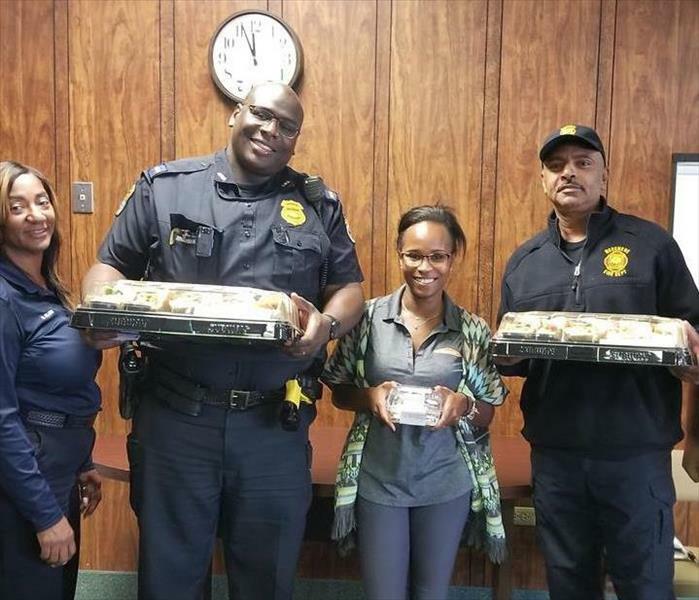 SERVPRO of Geauga County took lunch to the Woodmere Police & Fire Department for FEED THE FORCE. 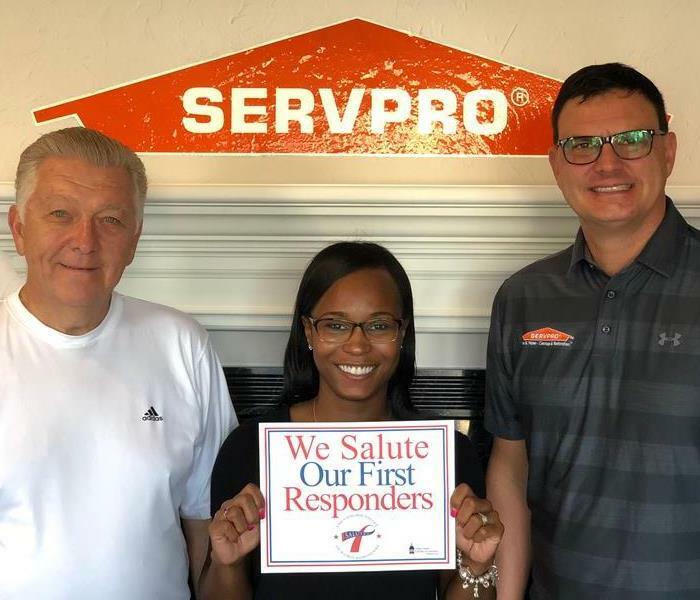 The Chagrin Valley Chamber of Commerce presented the “We Salute Our First Responders” certificate to SERVPRO of Geauga County to show support of the first responders in the Chagrin Falls community. 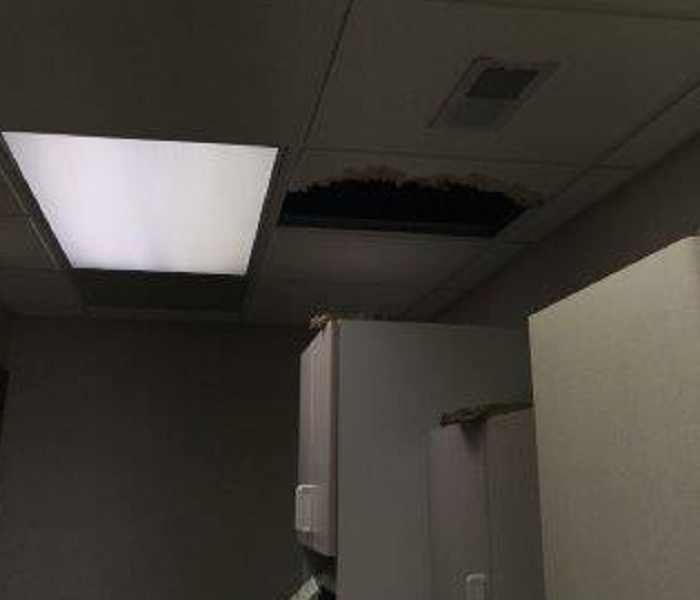 This office suffered from a water loss after a pipe break in the ceiling. The water had spread throughout the halls and into other offices. 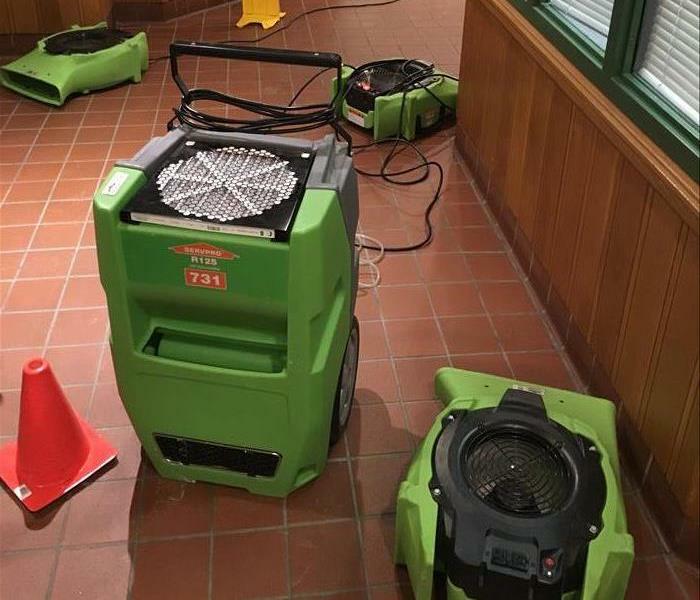 SERVPRO responded and quickly began mitigation procedures. 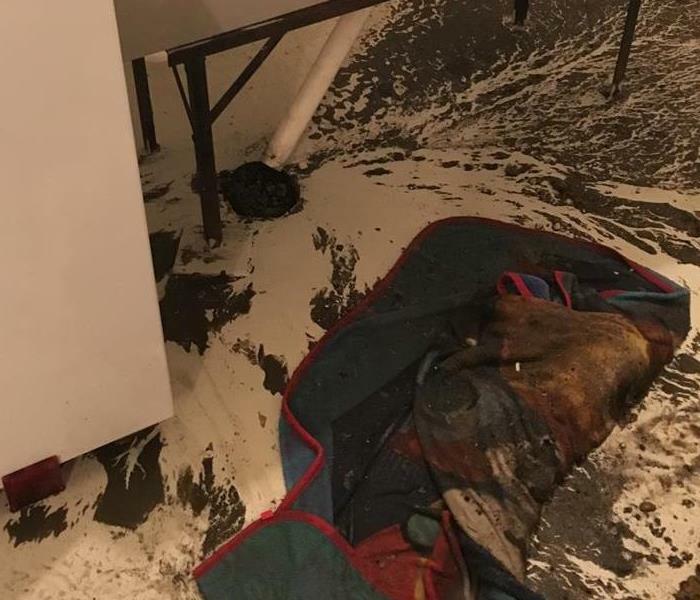 This laundry room suffered from a water loss after a water line break. SERVPRO responded immediately and began mitigation. The flooring and belongings were covered in nasty water. The team was able to clean the property and restore back to normal conditions. 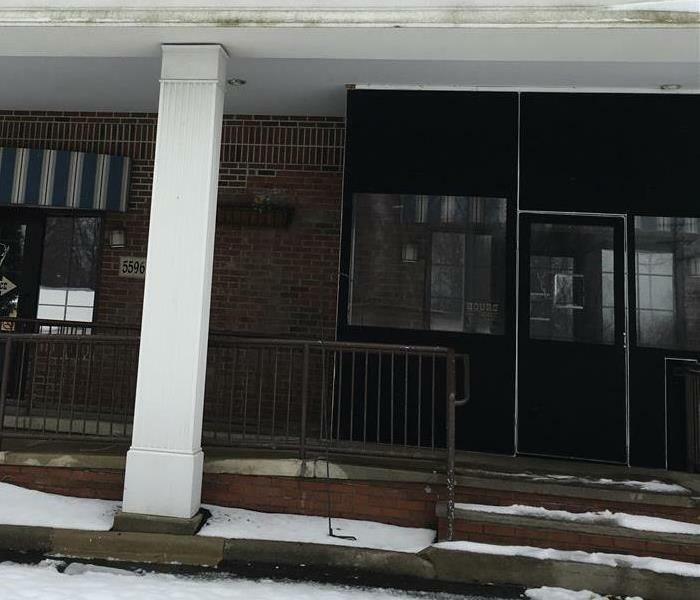 This medical office suffered from a water loss. there was significant water in the floor. 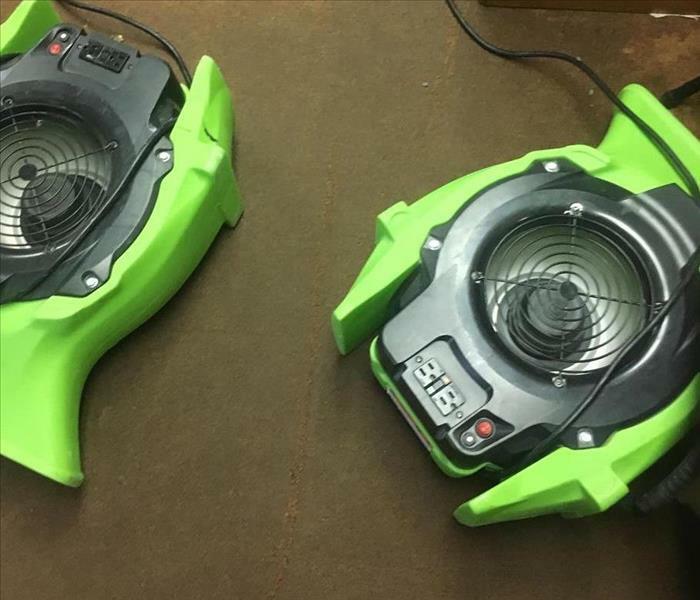 SERVPRO has professional cleaning and drying equipment for your water restoration needs. Contact us anytime 24/7. 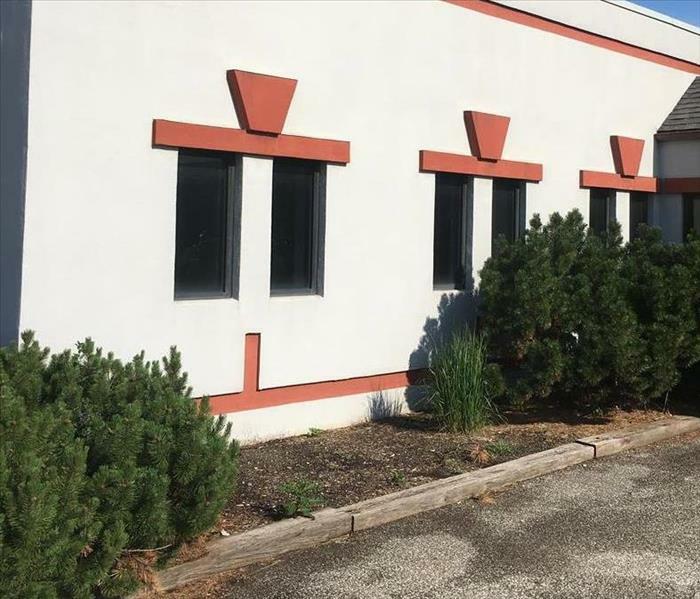 This commercial building suffered from a water loss. 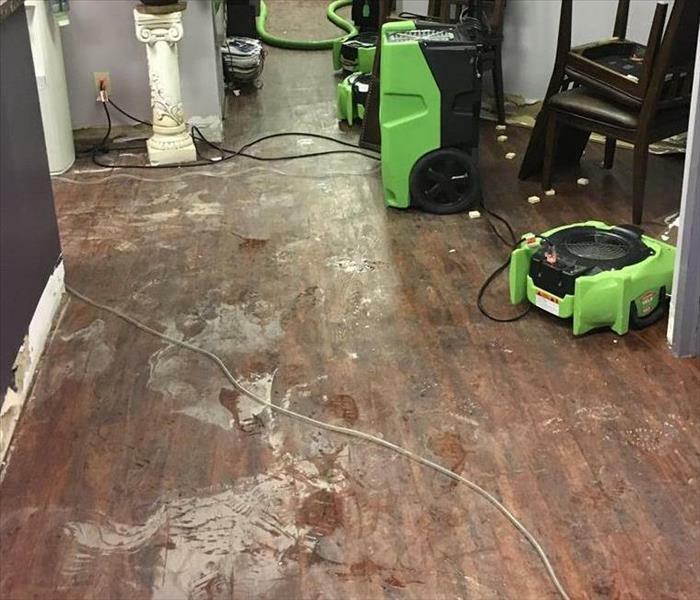 SERVPRO responded immediately and used professional drying equipment to extract the water from the flooring. 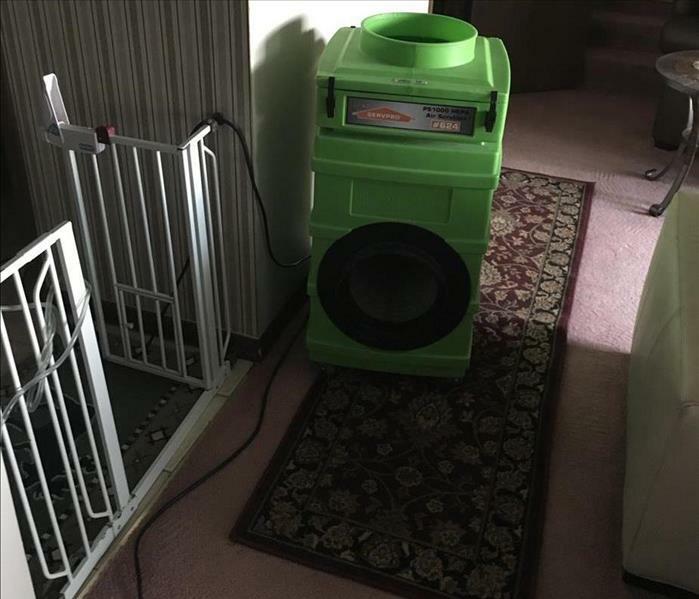 They placed dehumidifiers to remove the moisture from the air to prevent further damages. This dining room suffered from a water loss after a pipe break. The pipe leaking caused the ceiling drywall to fall and signifiant amount of water to leak in the floor. 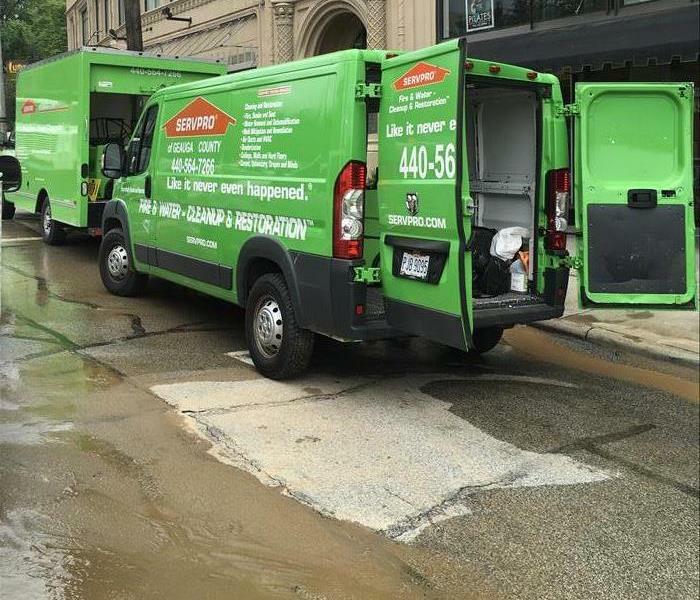 SERVPRO responded immediately and returned the home back to normal conditions. 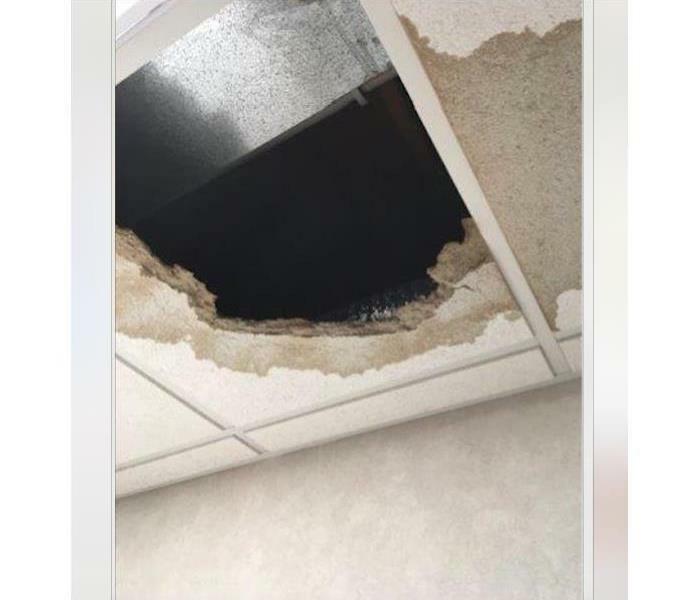 This facility suffered a water loss due a pipe break that caused water to pour through this drop ceiling, flooding the office below. We assessed the situation and began the process of mitigating the damage right away. 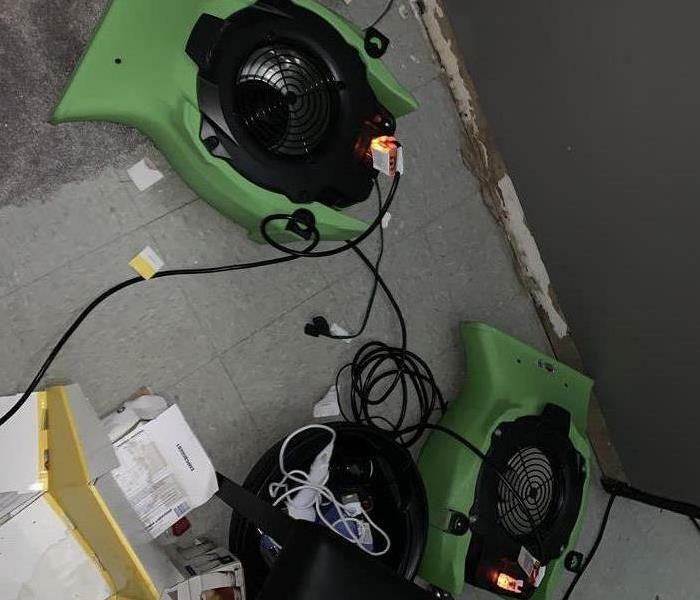 In this picture, you can see some air movers and a dehumidifier that have been placed in this room to dry up excess moisture left when recent storms caused flash floods that entered the facility. This facility had a significant amount of water pushed inside by recent heavy storms that caused flooding. Here you can see some of the damage done to the floor and the bottom of the reception desk. Heavy rains from a recent storm caused flash flooding that affected several structures in this area, including the building were this lobby is located. In this picture you can that the floor and baseboards were damaged. 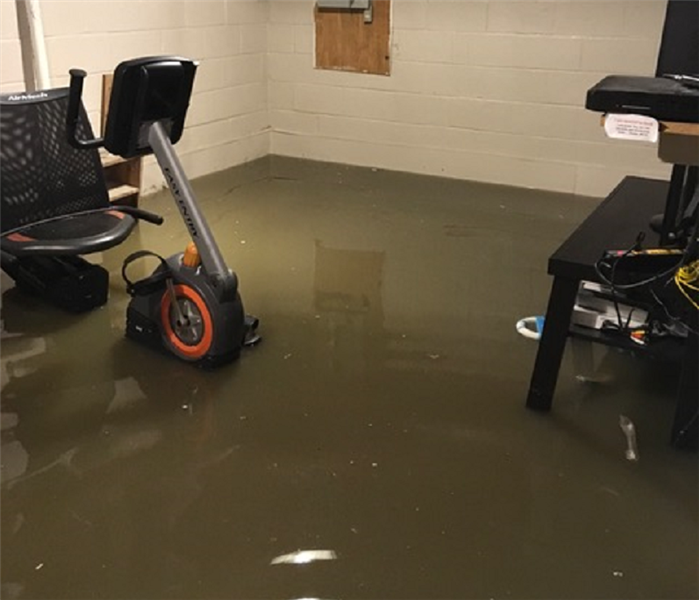 This office was flooded when debris from a storm blocked the outside drain, allowing water to enter the facility. The owner was very pleased with how quickly we were able to get them back up and running. 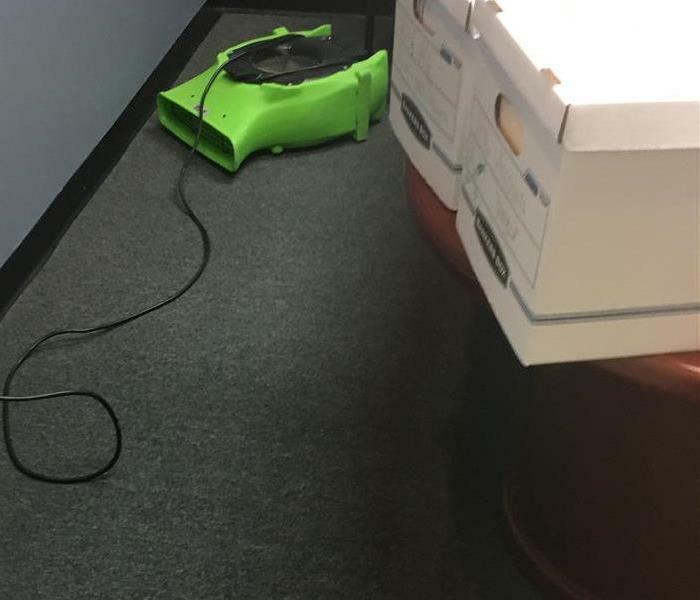 This office floor was soaked when a storm pushed flood water inside. 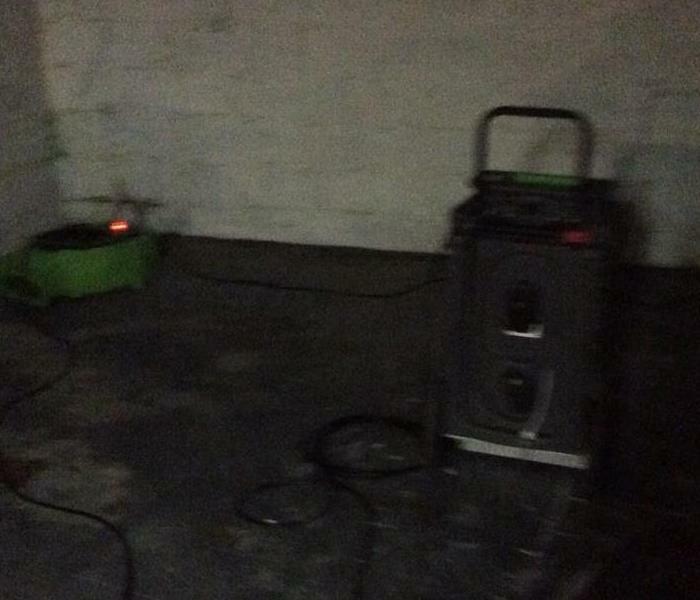 In this picture you can see some of the drying equipment we use placed on the floor to help dry up some of the excess moisture. This home was flooded when severe storms came through the area recently and caused flash flooding. 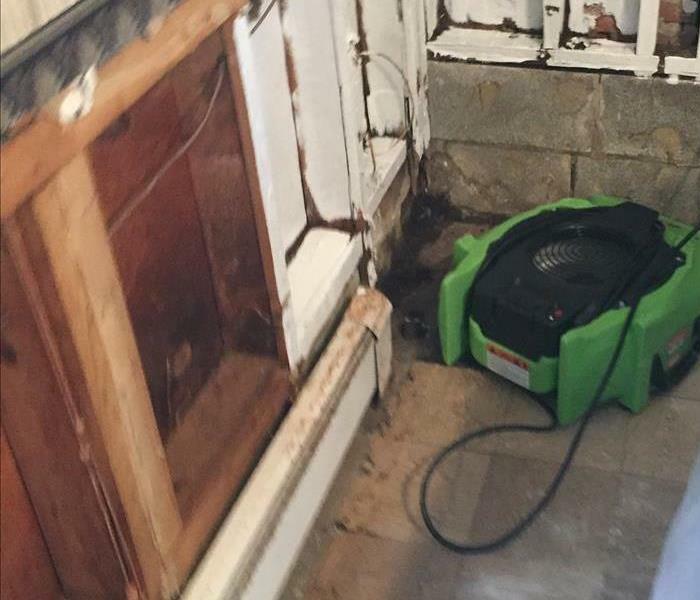 The water entered this home, damaging floors and walls. In this picture you can see the restoration in progress. 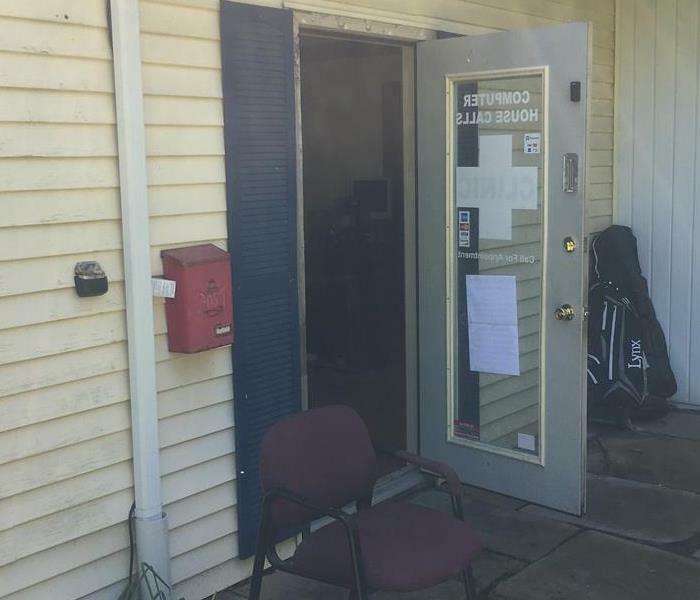 While this facility was temporarily closed, a moisture problem in the bathroom lead to a serious mold problem. When we had finished with the remediation of this facility, the owner told us that he was glad he called us. This restaurant suffered a heavy mold loss. We were called in to mitigate the damage. We dried up the moisture that was causing the mold and used air scrubbers to clean the air before repairing all the damage. The bedroom in this picture suffered a severe mold loss. We covered the bed as it was not damaged and put up a containment barrier. Then we placed air scrubbers in the room to pull contaminants out of the air. When we are working to repair any damaged structure, we try not to disturb unaffected areas. We make sure to put up containment barriers to keep contaminants from moving to other parts of the structure. In this case we are in the process of mitigating mold damage. This home had a moisture problem that resulted in a mold problem eventually. The owner called us and we went to work. In this picture, we have placed an air scrubber upstairs to remove contaminants from the air. This facility had a broken pipe that flooded the facility causing damage to the floors and the walls. We were able to repair the pipe and restore this facility in a time that made the owner very happy. 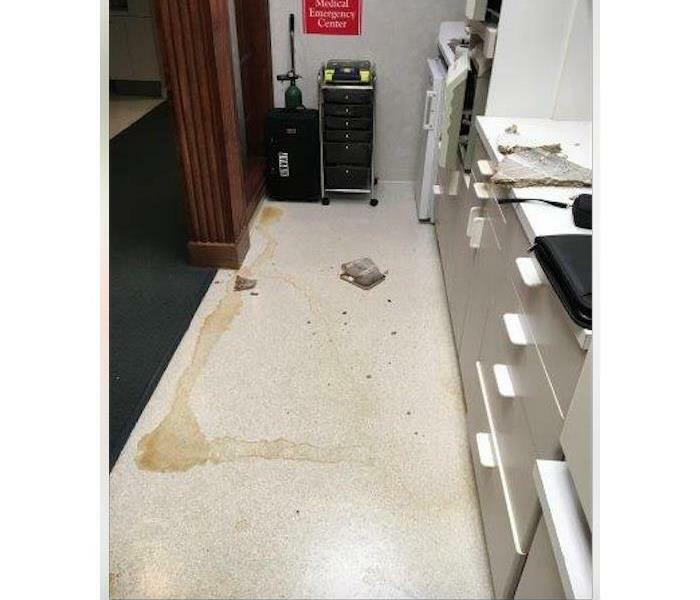 A severe leak in this shutoff valve caused water to pour into the office in the next room, damaging the carpet and walls heavily. We dried up all the moisture and then replaced the carpet and other damaged material. A broken water main caused flooding in the this facility. Once the main was no longer an issue, we were able to assess the damage and begin remediation of the massive water loss this facility suffered. 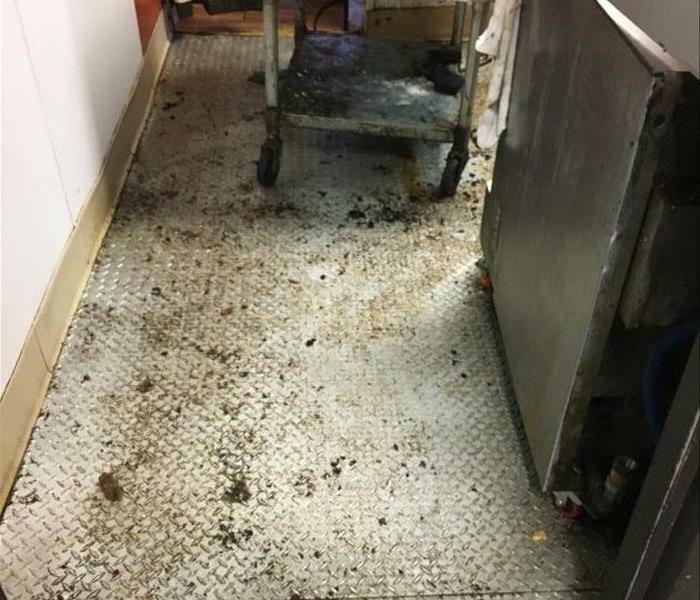 Mold is a serious problem, especially in a restaurant. 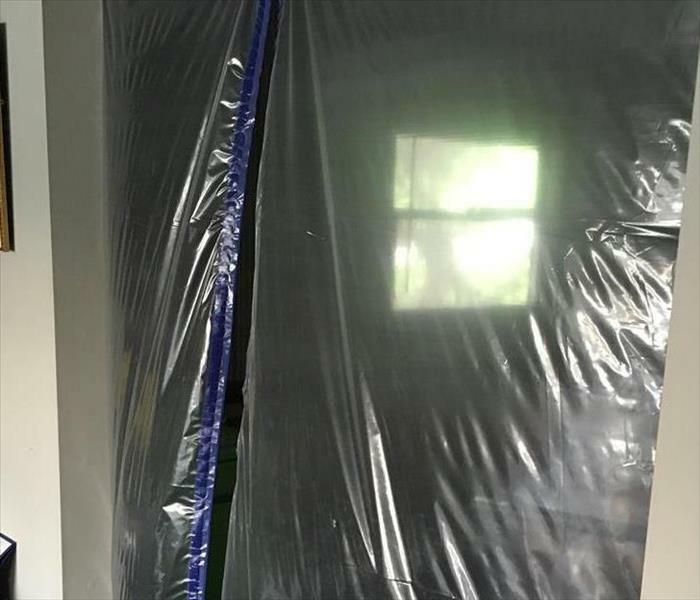 In this picture, you can see a mold problem that developed in a walk-in cooler. 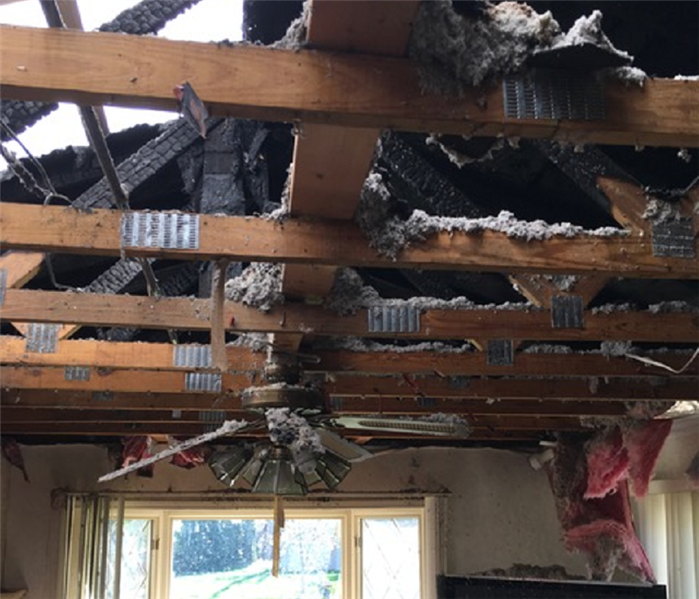 Proper mitigation of a mold loss like this is crucial to everyone's safety. 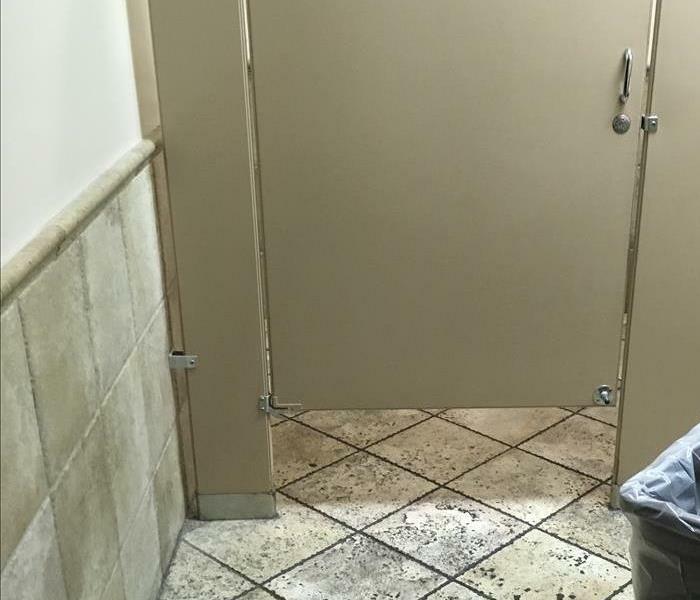 That's why you should call the pros at SERVPRO if you have a situation like this. 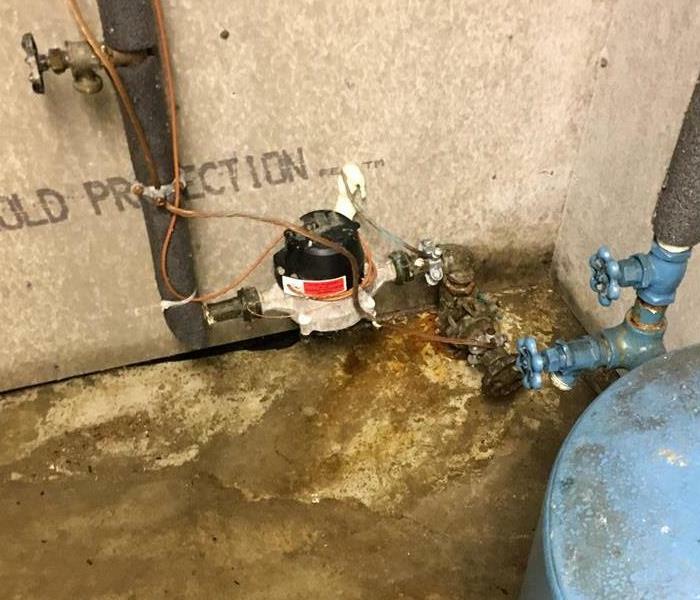 This facility had a water loss caused by a broken toilet supply line. The business owner came in to find his facility covered in water and immediately called us. We repaired the supply line and then cleaned up the damage. 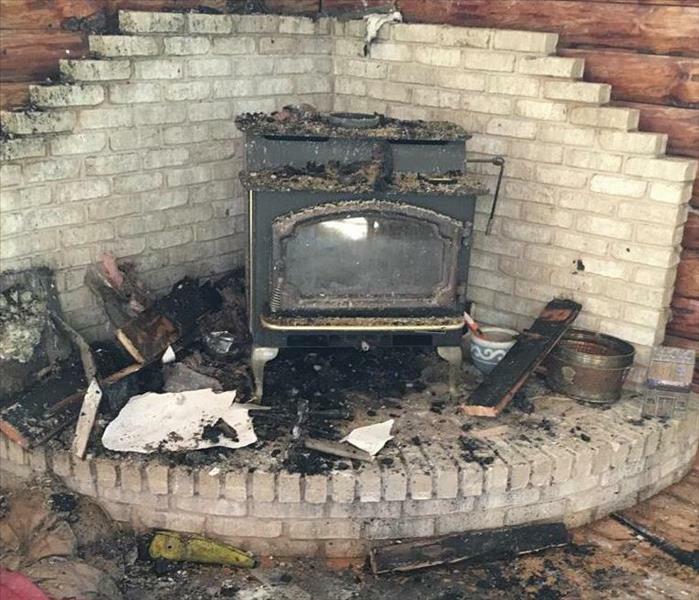 A fire from this woodstove caused significant damage to this home. It spread to several rooms of the house and destroyed everything in it's path. The homeowner was very thankful when we finished restoring her home. 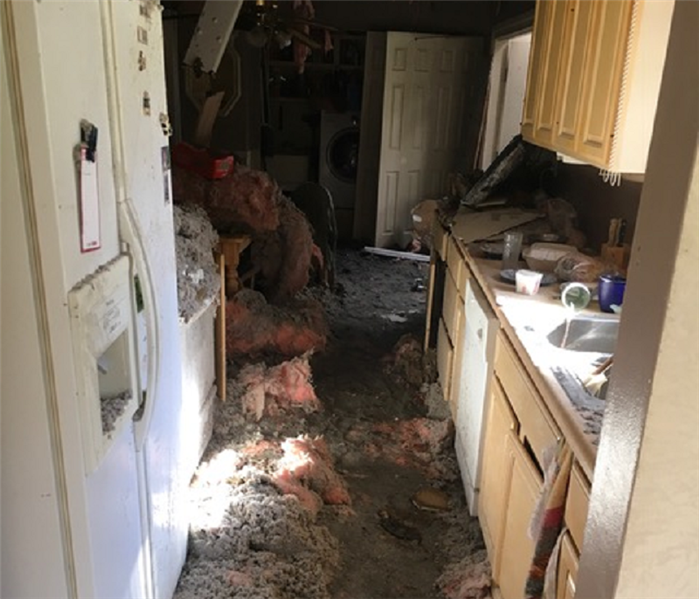 As you can see in this picture, this home suffered damage due to a fire that started in the kitchen. It then spread to the other rooms of the house quickly, damaging everything in it's path. 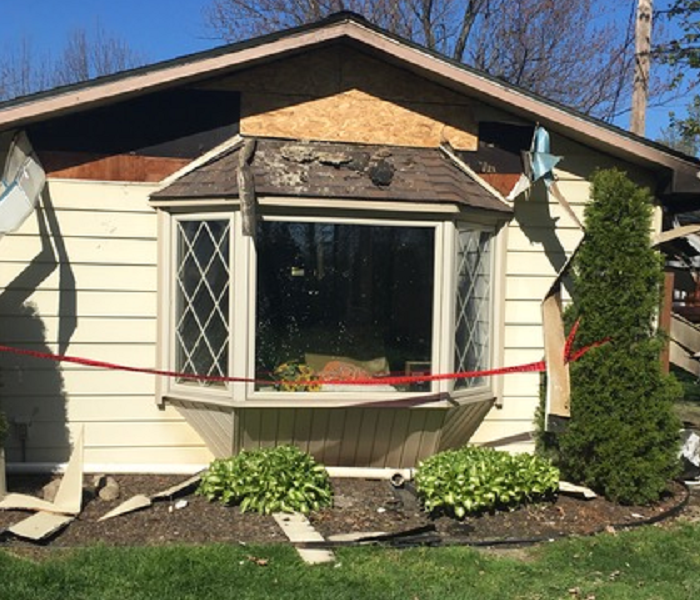 This home suffered damage from a large fire. It damaged most of the rooms in the house and burned through the roof as you can see in the picture. We were able to remove and replace all the damaged material and restore this home to it's previous condition. We not only train our technicians to handle your fire loss remediation, but we make sure they are equipped to safely do so. 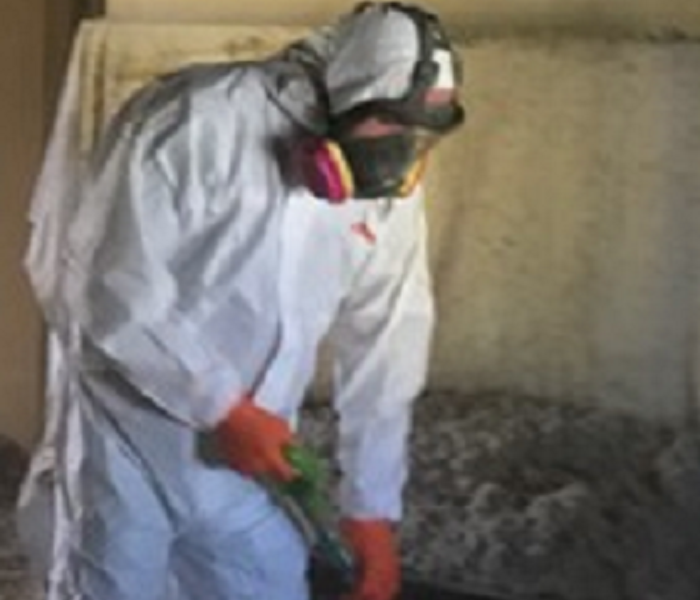 In this picture, you can see one of our technicians using the proper personal protective equipment while cleaning up a fire damaged home. 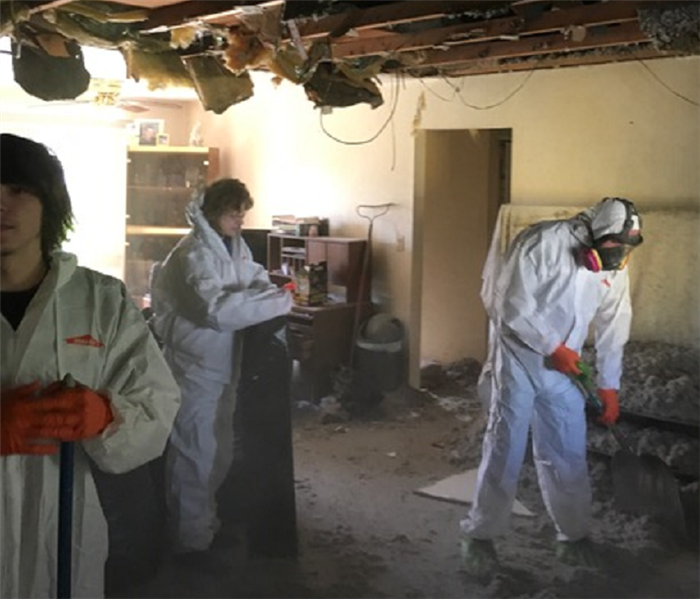 In this picture, you can see our team in action in the midst of cleaning up the damage done to a home during a major fire. Our technicians are trained and equipped to handle any fire loss you may experience! This home had a major fire loss as you can see from the picture. It destroyed most of the home leaving the owner devastated. The owner called us to help restore her home and was very pleased with our services. 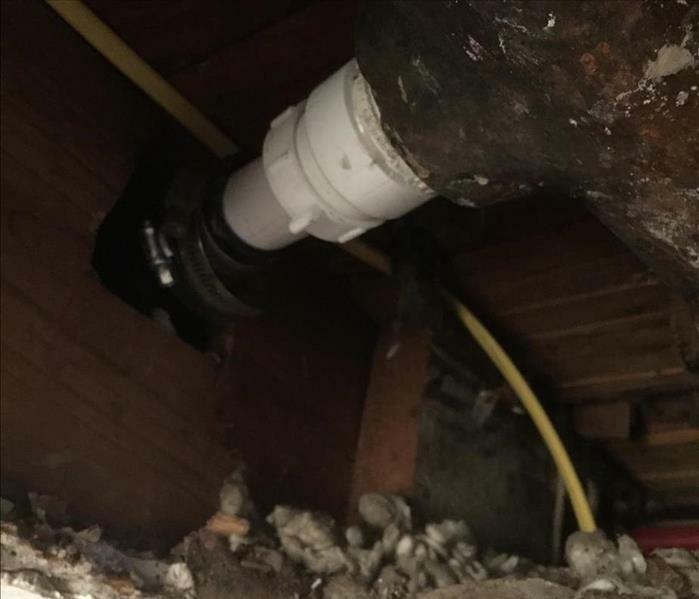 The pipe in this picture was leaking into the ceiling, causing the insulation to become wet and the ceiling to sag heavily. Our team came in and assessed the damage, then removed the all the affected material and made the repairs. 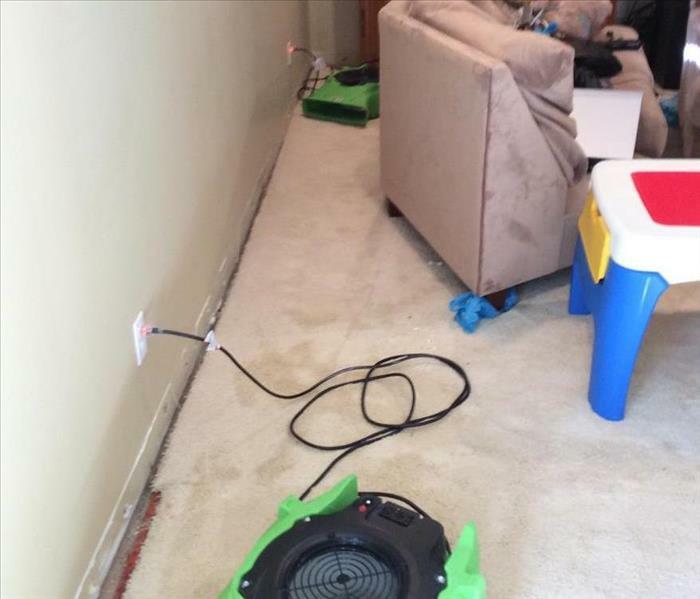 If your basement sits below ground level, then you know all about the need for sump pumps. You also know that if it goes out, it can cause your basement to flood like the one pictured here. If it happens to you, call us! 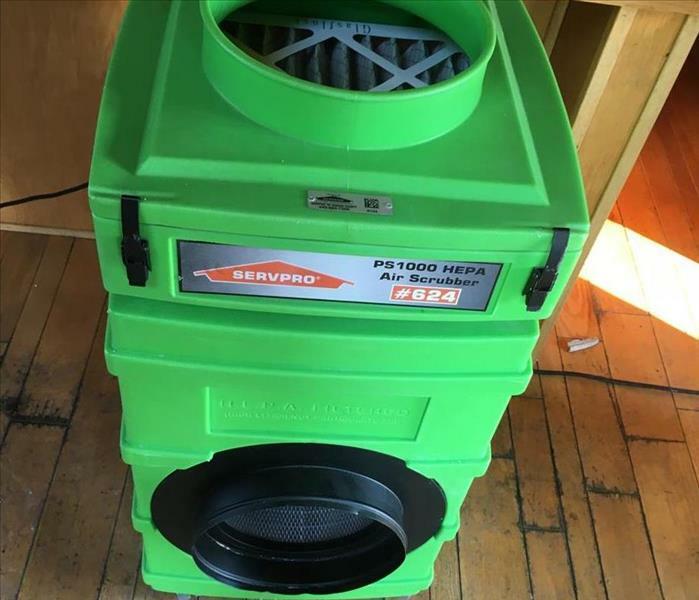 On many jobs, SERVPRO of Geauga County has to have air scrubbers on site to make sure that the air quality is under control. We are proud to have official green equipment that is used on jobs. 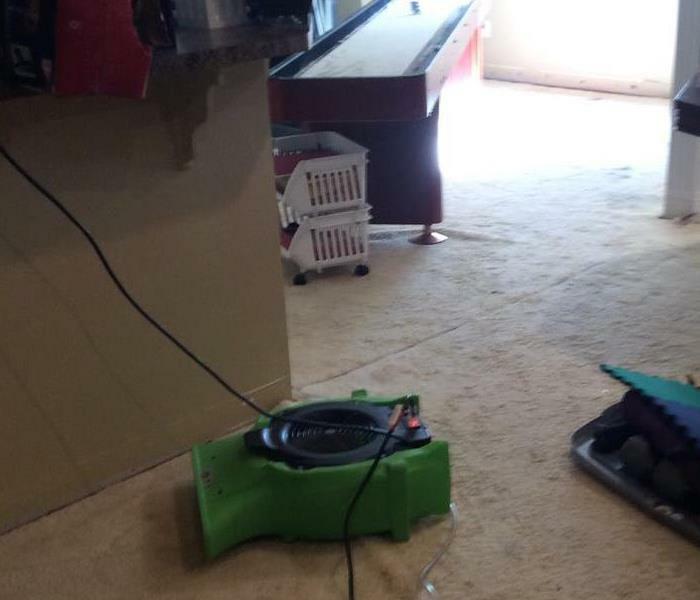 This home had a lot of water damage that SERVPRO of Geauga County was called to cleanup. We were quick to respond and start the drying process. If you have any questions on how to clean and dry your home after a water loss, give us a call at (440) 564-7266. This is our team placing air movers on site to help with the drying process. Each day our team went on site and checked the moisture levels and see where the home was in the drying process. 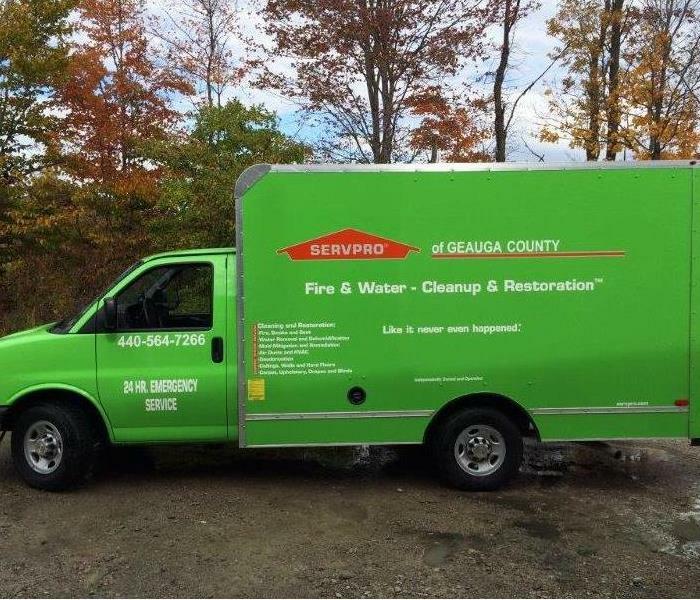 SERVPRO of Geauga County was called to this Church to help dry and minimize damages. 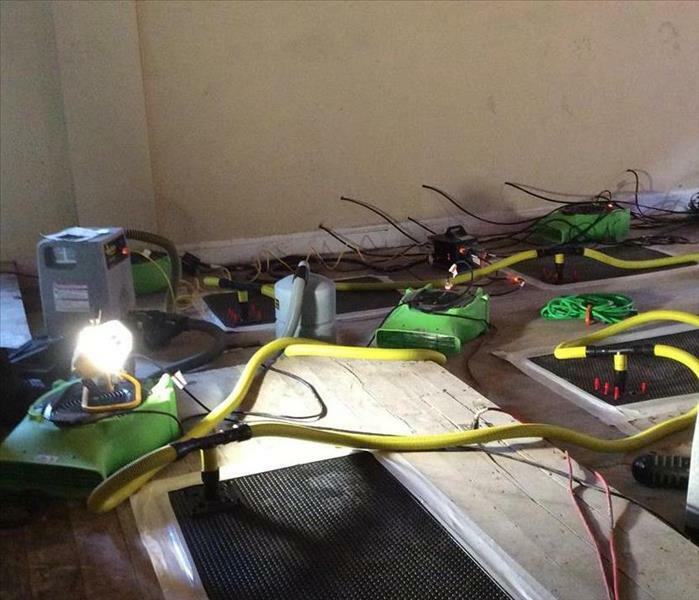 This is a picture of our team using drying mats to help mitigate the damages to these wood floors. If you have any questions on how the drying process works, feel free to call us at (440) 564-7266. We have a large quantity of air movers to handle any size water loss. Air movement is a critical step when experiencing a water loss to make sure the job is done right.